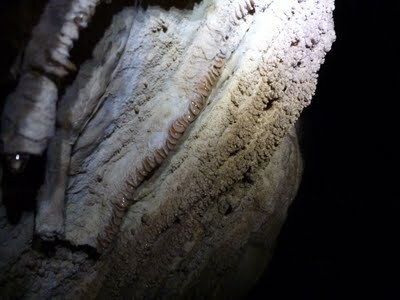 South Madhouse Cave – Utah County – Starting From the start of the cave, rappel into the cave about 15 ft or so. After that follow that room downhill through several cracks. Be careful, You will come across a little pit you drop into. This pit is about 6ft deep. From there you can slip and crawl through another crack that is quite tight. This is where you might come across some popcorn formations. The cave continues beside another crack until it dead-ends.This is a fun cave to start a little vertical work with. Please practice before you go, as it is a little harder in dark places.